Q. Does the library have test preparation materials? The library keeps a number of current test preparation materials on reserve for in-library use. 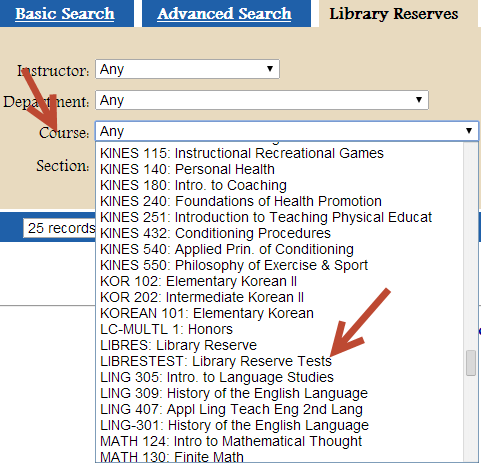 You can browse titles by selecting LIBRESTESTS: Library Reserve Tests from the Course popup box on the Reserves page. This is demonstrated in screen shots below. We also have a database called Learning Express Library, which provides test preparation materials for the GED, TOEFL, CLEP, and TOEIC. Learning Express also contains other useful materials for learning software, job skills, and for resume and cover letter writing. Non-BSU students who are Idaho residents can get to Learning Express via LiLi. Step 1: from the library homepage (library.boisestate.edu), click on the Reserves tab. Step 2: click the Find Course Reserves link. Step 3: Click the Course Reserves Materials link. Step 4. Click on the popup menu next to Course and select LIBRESTESTS: Library Reserve Tests. Step 4: Scroll through the pages to find materials of interest, jot down the call numbers, and take them to the Reserves desk on the first floor of the library.